Amsterdam, 26 March 2019 - AMS-IX, the world’s leading internet exchange, is proud to announce that AMS-IX Caribbean is expanding into Blue NAP Americas (BNA) data centre in Willemstad, Curaçao. The Blue NAP Americas data centre will become the second AMS-IX Point-of-Presence (POP) in the Caribbean region next to the E-Commerce Park (ECP) data centre where AMS-IX Caribbean is present since 2008. 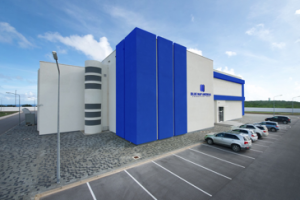 Photo caption: Blue NAP Americas Tier-IV data centre Curaçao. The second Point-of-Presence (POP) of AMS-IX Caribbean. AMS-IX Caribbean, a neutral Internet Exchange (IX) based in Curaçao, offers high quality IP peering and interconnectivity services, whether it be traditional data, Voice-over-IP, mobile traffic, or video, for the Caribbean and South American region. Since April 2013, the Caribbean Internet Exchange (CAR-IX) is an integral part of the AMS-IX environment and carries the name AMS-IX Caribbean.